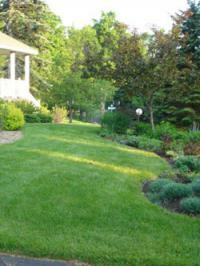 Assess lawn mid-Aug or early Sept to maintain, renovate, or replace. Blog / Lawns / Time for Lawn Assessment: Maintain, Renovate, or Replace? Time for Lawn Assessment: Maintain, Renovate, or Replace? Mid-August and early September are good times to focus on lawn care. This blog is the first of a three-part series on lawn assessment, replacement, and maintenance. Take a good look at your lawn. Is it struggling? That’s not surprising given the punishing heat and drought this summer! Don’t despair, though, we have answers for you. A healthy lawn starts with choosing grasses. Here in Buncombe County, we grow fescues and Kentucky bluegrasses, cool season grasses that look good much of the year, but languish in the summer heat. We don’t grow warm season grasses—such as zoysia and bermudagrass which like the heat of summer—because they brown up as they go dormant in the cooler weather we have most of the year. Like all plants, grasses require sun, water, and nutrients to thrive, so even the right grasses may die out, or be quickly overrun with weeds. Grasses need sun much of the day, so look carefully at where you’re trying to grow a lawn. Give up on areas where buildings, trees, or shrubs shade your grass. Too little and too much water are both problems for lawns. Avoid grasses in very dry or very wet areas of your yard unless you can provide irrigation or improve drainage, respectively. Lawn grasses often require lime to be able to take advantage of soil nutrients and nitrogen fertilizer annually. Soil testing at least every three years will tell you how much lime to add and if you need phosphorus or potassium in addition to nitrogen when you fertilize. Don’t have more lawn than you can keep regularly mowed. Cool season grasses do best mowed to three inches, cutting off no more than an inch or so of the grass blade. In the mountains, slopes pose another obstacle to having a great lawn. Although grasses can help prevent erosion, don’t plant a lawn where you won’t feel comfortable mowing! If your lawn is growing in all the places you want it to grow, you need only to follow a good maintenance plan this fall to have the lawn of your dreams. (Watch for coming blog!) Not your reality? Renovate as temperatures begin to drop after mid-August. NC State turf specialists recommend overseeding bare spots with a seed mix of tall fescue cultivars at the rate of 6 pounds per 1000 square feet of lawn. Fertilize with a lawn starter fertilizer high in phosphorus. You must keep your seeds moist with light, gentle, watering, which may need to be done more than once a day if the soil starts to dry. Smothering: burying the surface under several inches of mulch, such as arborist’s wood chips. Using a broad-spectrum herbicide that will kill both grasses and broadleaf weeds. For smothering, solarizing, and stripping, you can cut the lawn low to help kill the plants. If you use herbicides, be sure you apply to an actively growing, uncut, well-watered lawn, and be very careful you don’t allow any of the product to drift onto desirable plants or shrubs. While your lawn is dying, consider what you want in its place! We’ll have some suggestions! For help with grass and weed identification, go to http://turfid.ncsu.edu/.